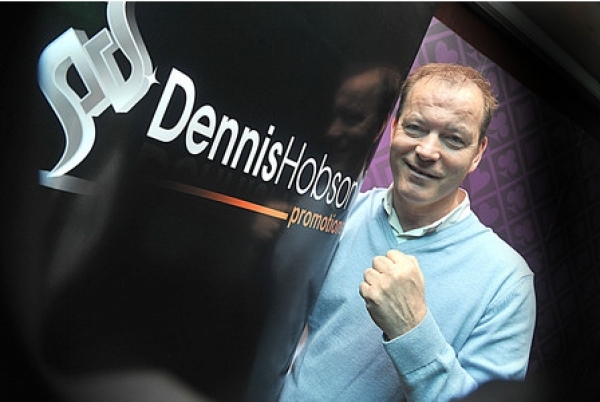 Dennis Hobson has hailed the first show of his 12-fight deal with the Freesports TV channel as a huge success. On Friday October 13, at Sheffield’s Ponds Forge Arena, Commonwealth middleweight champion Sam Sheedy and challenger Liam Cameron engaged in a tremendous battle, that saw Sheedy eventually overwhelmed and stopped on his feet in the eighth round. In between the first bell and the contest being waved off; ‘Speedy’ Sheedy exhibited amazing courage, continually fighting back despite tasting the canvas four times, as well as taking a standing count in the penultimate round. ‘Cannonball’ Cameron boxed superbly, finding the perfect balance between defence and attack, and landing heavy artillery to eventually wear down his Sheffield rival and claim Commonwealth honours. With social media users buzzing about the show, and boxing fans and insiders lauding the quality of the production as well as the TV-friendly main event, Hobson is excited about the future. The man who broke Ricky Hatton in America, as well as guiding the likes of Clinton Woods, Jamie McDonnell and Stuart Hall to world titles, will soon be announcing a number of future shows from across the country, and says boxing fans can expect more top-quality ‘Freesports Fight Nights’ on the free-to-air channel. “I was telling everyone that the main fight would be a cracker,” explained the Sheffield fight-figure. “We lost a few undercard fights, including the chief support of Loua Nassa in a Challenge Belt fight. But I said, no matter what, the headline fight would carry the show. People were saying that Sheedy would have too much, and Liam has always fallen short, but I said it was a 50-50 and that there was something different about Liam. I never would have imagined it would have the drama it did though, and it was a fantastic spectacle. “I said to the production people afterwards, ‘what did I tell you’! I was really pleased with the production too. We had my pal Glenn McCrory on commentary who’s full of polish, and I thought Glenn and Dominic McGuinness complemented each other really well. I thought everything about the show was quality. It was the first show, and might not have had the glitz of a PPV, but as a spectacle it was great. It was all a bit of a rush, so, there’s a lot of shaping to be done, but as a first show, I’m absolutely over the moon with it.